y finding new uses for its historic structures and working closely with the regional university, Pittsburg hopes to spur greater economic opportunity to attract new residents and keep students after graduation. The National Complete Streets Coalition reports on the national epidemic of pedestrian fatalities, offering county-, metro-, and state-level data on traffic fatalities and an interactive map of each loss in the decade 2003 through 2012. This resource specific profiles the state of Kansas. Mission Transit Center. Image via the Federal Transit Administration. Mission City, Missouri recently celebrated the grand opening of the Mission Transit Center, a new transportation hub serving Johnson County designed to enhance service for current riders, attract new riders and connect transit to key areas where people live, work and play. In 2010, the greater Kansas City region was awarded a $50 million grant through the U.S. Department of Transportation’s Transportation Investments Generating Economic Recovery (TIGER) program to assist transportation and infrastructure projects in the region. As part of the grant, Johnson County was awarded $10.7 million to upgrade its transit system. Guests at Smart Growth America’s 2013 Leadership Awards cheered (literally!) for smart growth, as well as the three recipients of this year’s awards. Progressive Insurance was honored for its Snapshot program, the most widely available usage-based auto insurance program on the market today. 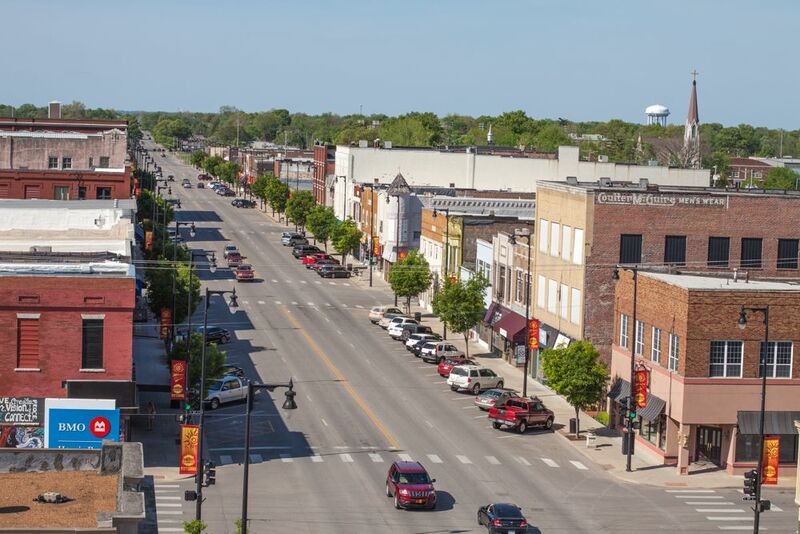 Mayor Laura McConwell and the City of Mission, Kansas were honored for their commitment to investing in infrastructure. And Mayor Randy Rhoads and the City of Lee’s Summit, Missouri were honored for their focus on healthy, active transportation systems. The Sylvester Powell Jr. Community Center in Mission, Kansas. Earlier this week we announced the winners of our 2013 Leadership Awards. Mayor Laura McConwell and Mission, Kansas were one of the winners. Mission is a first-generation suburb of just under 10,000 people, located 8 miles south of downtown Kansas City, Missouri. At just 2.7 square miles, Mission feels like a small town despite being minutes away from the center city. Some might see Mission’s small size as an obstacle to economic vitality. But the community in Mission saw smart growth strategies as a way to raise the profile of the city far beyond it’s small size. Mayor Laura McConwell has helped make those plans a reality. McConwell has served as the City of Mission’s Mayor since 2002, replacing Sylvester Powell who served as mayor for the previous 25 years. Originally inspired to serve on the town council to speak for young families who at that time were not well-represented, McConwell has become a driving force behind several impressive smart growth and sustainability initiatives in the city. Two mayors and one company are being honored this week with national awards for their leadership on better development strategies. Mayor Randy Rhoads of Lee’s Summit, MO and Mayor Laura McConwell of Mission, KS have been selected to receive Smart Growth America’s 2013 Leadership Awards. They are joined by Progressive Insurance, for its Snapshot pay-as-you-drive auto insurance. As Kansas City prepares for a special election on a proposed downtown streetcar line, KCPT and the Mid-America Regional Council‘s Imagine KC series examines the impact of transit-oriented development on Kansas City’s metro. KCPT’s Randy Mason and LOCUS President Chris Leinberger toured some of Kansas City’s streetscape along the proposed line, and discussed the commerce and development streetcar proponents predict will follow. On April 18, 2012, Chris Leinberger, President of LOCUS, visited Kansas City, MO to discuss walkable neighborhoods as part of the Kansas City Public Libraries series on What Makes a Great City. The Wichita Eagle reported recently that the Wichita City Council voted 6-1 to join Sedgwick County in participating in a Regional Area Economic Partnership funded by a Department of Housing and Urban Development Regional Planning grant. The Regional Area Economic Partnership (REAP) will focus on producing a sustainable community plan to address transportation, water, and health issues. REAP has an existing 23-member consortium that includes 4 other counties as well as Wichita State University.